The Oilholic is back in the UAE for Gulf Intelligence's 2018 Energy Markets Forum with the great and good of the Port of Fujairah and 'crude' shores beyond in attendance. The event, as this blogger has previously noted, continues to grow bigger by the year. 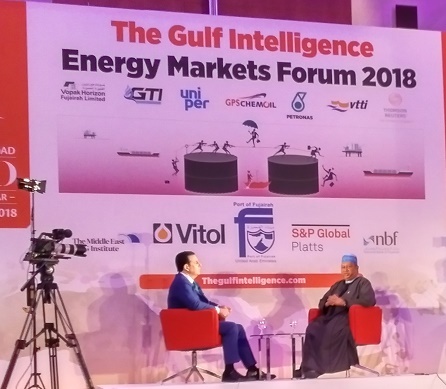 The latest edition was graced by none other than OPEC Secretary General Mohammed Barkindo who, in a nutshell, told gathered delegates the OPEC and non-OPEC association - that has taken 1.8 million barrels per day of oil production out of the market - was "here to stay." Of course, most most analysts here in Fujairah reckon the upcoming Algiers meeting would be a testy affair to say the least, and well test the relationship. It would be surprising if Iran versus US President Donald Trump doesn't appear on the agenda, along with the whole kit and caboodle of the Iranian delegation in tow. However, for his part Barkindo said Iran remains an "integral" part of OPEC as a founding partner but ventured to say little beyond a show of solidarity. Right after the Secretary General's quotes came a regular feature of the event – a spot of poll of delegates on a variety of issues dominating the crude market – hosted this year by yours truly. Gulf Intelligence would be publishing the details shortly. But to give the readers of this blog a snippet - invariably the direction of the oil price came up. While some kindred souls were in agreement with the Oilholic of an average $70-75 per barrel Brent price over the short-term, EMF 2018 attendees, in the main, sounded incredibly bullish predicting $80+ prices for 2019. This blogger's issue is that there are just too many variables to be that bullish – Trumpet politics, US-China tussles, plenty of crude in the global pool, geopolitics, you name it. Not all variables are bullish and are tugging each other. Guess time will tell! But that's all from Fujairah folks! Keep reading, keep it crude! © Gaurav Sharma 2018. Photo: OPEC Secretary General Mohammed Barkindo talks to John Defterios of CNN at Gulf Intelligence's 2018 Energy Markets Forum in Fujairah, UAE © Gaurav Sharma, September 2018.